Mindy Kaling graces the cover of this month's issue of Flare magazine, and in the accompanying interview addresses the curious fact that even though all of the main characters in The Mindy Project work in an OB-GYN clinic, the show has never brought up abortion. Well, she sort of addressed it. Savvy profile subject that she is, Mindy deflects answering her interviewer's question about abortion, saying, "It would be demeaning to the topic to talk about it in a half-hour sitcom." Sure about that, Mindy? While rare, abortion is far from uncharted territory on American television, and even on half hour sitcoms. In a 1972 episode of Maude — pre-Roe v. Wade! — the show's heroine found herself pregnant at age 47, had an abortion, and everything turned out fine. Ten years later, in 1982, a Facts of Life episode centered around Natalie writing a story for the school paper on a classmate's secret abortion. And in 1994, the Thanksgiving episode of Roseanne included Nana Mary showing up and discussing two abortions she's had in the past. And there was a laugh track behind that one. Scrubs, a madcap comedy that centered in a goddamn hospital even talked about abortion, back in 2006. Kaling's claim that some things are too serious to tackle in a comedic format remind me of something Jenny Slate said earlier this year in an interview with the Guardian. The Obvious Child star expressed dismay that critics were referring to her film as an "abortion rom com." "Ugh, that is such a bummer, that term. An abortion romcom – that's not a thing!" Slate says with an eye-roll. "The movie isn't saying that abortions are funny. It's saying that people are funny." Joking about a thing doesn't mean you think the thing is funny. It means it's part of a joke. Kaling's gynecology clinic-centered show at least offering a passing mention to a gynecological procedure that one in three women will have in her lifetime wouldn't be the show laughing at abortion. It would be funny people cast to be funny on a funny show acknowledging a fairly pedestrian reality in the lives of women, gynecologists, and especially gynecologists who happen to be women. 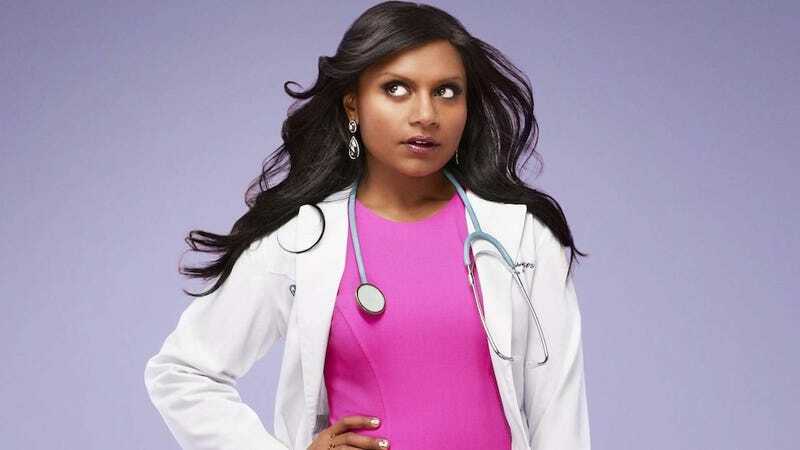 Ultimately, The Mindy Project is Kaling's show, and if she doesn't want to tackle the issue, she shouldn't have to. She's the boss. But "abortion is too serious" is a flimsy excuse for such a deliberate dodge of an obvious issue that would face gynecologists, an issue that has been tackled successfully by other half hour sitcoms for decades.